Learn about the temperature and how start-stop shortens the life of a starter battery. Heat is a killer of all batteries, but high temperatures cannot always be avoided. This is the case with a battery inside a laptop, a starter battery under the hood of a car and stationary batteries in a tin shelter under the hot sun. As a guideline, each 8°C (15°F) rise in temperature cuts the life of a sealed lead acid battery in half. This means that a VRLA battery for stationary applications specified to last for 10 years at 25°C (77°F) would only live 5 years if continuously exposed to 33°C (92°F) and 30 months if kept at a constant desert temperature of 41°C (106°F). Once the battery is damaged by heat, the capacity cannot be restored. According to the 2010 BCI Failure Mode Study, starter batteries have become more heat-resistant. In the 2000 study, a rise in temperature of 7°C (12°F) affected battery life by roughly one year; in 2010 the heat tolerance has been widened to 12°C (22°F). Other statistics reveal that in 1962, a starter battery lasted 34 months; technical improvements increased the life expectancy in 2000 to 41 months. In 2010, BCI reported an average age of 55 months for starter batteries, with the cooler North attaining 59 months and the warmer South 47 months. Colloquial evidence in 2015 revealed that a battery kept in the trunk of a car lasted one year longer than if positioned in the engine compartment. 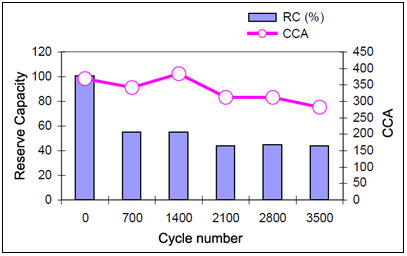 Figure 1 shows a capacity drop from 100 percent to about 50 percent after the battery had been exposed to 700 micro cycles. The simulated start-stop test was performed in the Cadex laboratories. CCA remains high and only shows a decline after about 2,000 cycles. Figure 1: Capacity-drop of a starter battery in start-stop configuration. The capacity drops to about 50 percent after 2 years of use. AGM battery is more robust. Test method: The battery was fully charged and then discharged to 70% to resemble SoC of a micro hybrid in real life. The battery was then discharged at 25A for 40 seconds to simulate the engine off with the headlights on. To simulate cranking and driving, the battery was briefly discharged at 400A and then recharged. CCA was taken with the Spectro CA-12. When connected in series, the voltage of each cell must be uniform, and this is especially important in large stationary battery systems. With time, individual cells fall out of line but applying an equalizing charge every 6 months or so should bring the cells back to similar voltage levels. (See BU-404: Equalizing Charge) What makes this service so difficult is providing the right remedy to each cell. While equalizing will boost the needy cells, the healthy cell gets stressed if the equalizing charge is applied carelessly. Gel and AGM batteries have lower overcharge acceptance than the flooded version and different equalizing conditions apply. Flooded lead acid batteries are one of the most reliable systems and are well suited for hot climates. With good maintenance these batteries last up to 20 years. The disadvantages are the need for watering and good ventilation. When VRLA was introduced in the 1980s, manufacturers claimed similar life expectancy to the flooded systems, and the telecom industry was enticed to switch to these maintenance-free batteries. By mid-1990 it became apparent that the life of VRLA did not live up to the flooded type; the typical service life of the VRLA is 5–10 years, less than half of the flooded equivalent. It was furthermore noticed that exposing VRLA batteries to temperatures above 40°C (104°F) could cause a thermal runaway due to dry-out.